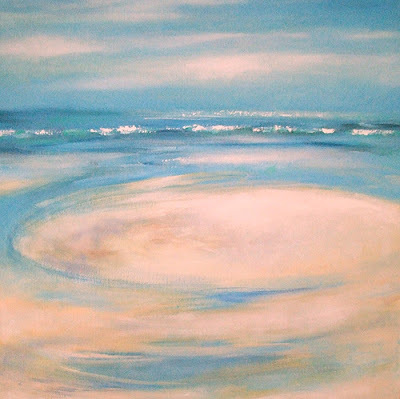 this one underwent a few changes :>) - I decided to have the tide in, rather than having a beach with pools - the waves made for a better composition and I like the perspective of being in the air, hovering somewhere over the waves. I also sorted that sky that I hated. You can see the very early stages here http://vivienb.blogspot.com/2008/01/work-in-progress-seascapes-stage-3.html (it's the third image down in this post) and at a later ugly underpainting stage here http://vivienb.blogspot.com/2008/01/seascapes-update-work-in-progress-16th.html when I was planning to keep the foreground as sand and pools. Lots of that underpainting still shines through in the final version. I wasn't at all happy about it until I sorted the sky out and made that decision about the high tide, then it came together, at last. Do you work in series? Do you like to look at the same scene or small area in different lights and seasons? This is a website I set up for the classes to show off their work - you'll see the wide range of subjects, media, styles and experience - the differentiation I talked about in my last post on teaching styles. 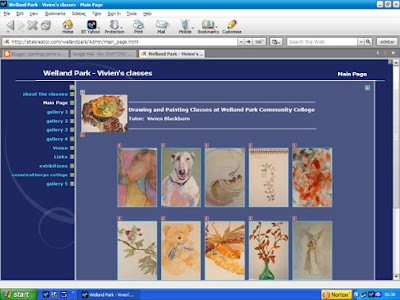 website address: http://sitekreator.com/wellandpark it's worth a look - there are some talented students in my classes :>) previous posts on teaching in this series: http://vivienb.blogspot.com/search/label/teaching (2 posts) and http://vivienb.blogspot.com/search/label/teachers where I talk about the good teachers I've studied with . 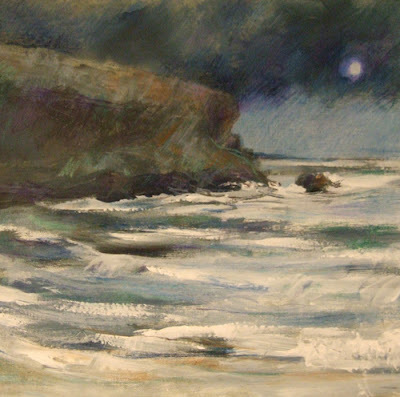 So far all the paintings I've done of this subject have been daytime or evening - I wanted to catch a nightime view and also do a painting with the tide high. I underpainted in a mix of ultramarine and raw umber and white. Ultramarine or indigo and burnt umber are what Paynes Gray is made up with - so that's a colour you really don't need to buy. If you mix your own you can tip it slightly bluer or slightly browner and have a little variety, which I think is more interesting than a flat colour. 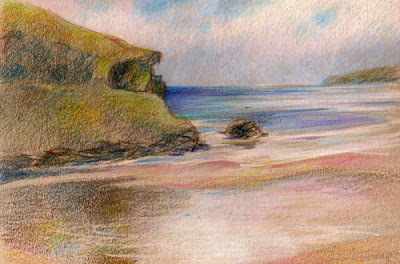 I then added touches of colour on the cliffs, in the clouds and the sea in purple, blues, green, ochre and brown coloured pencils. 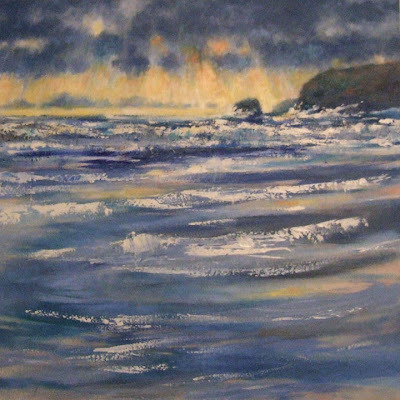 The underlying acrylics create a unity of colour and help with the night time feeling. Following some good advice I've lightened his nostrils from the last post - I think it's much better now. Do you think so? Crit from friends with a clear fresh eye is so useful. 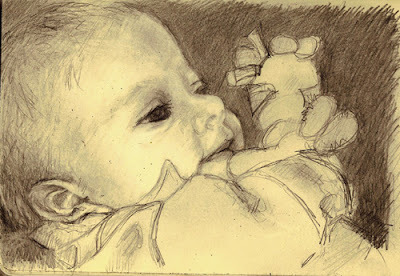 Drawing babies isn't the easiest thing to do - but now Sam is developing a distinct character and personality of his own it's getting easier. This is in my moleskine sketchbook - I do wish they would make a larger size of these because I like them for drawing in but even this 'large' size is in fact small. He was absolutely delighted with this stuffed toy that jingled and made noises and he's very sociable, loving the interaction with those around him. He has very dark eyes. It made a change from the beaches :>) . Done using willow charcoal, polychromos and Lyra coloured pencils and a battery operated eraser on grey rough paper (which eats the pencils). The curve in the horizon is the paper not lying flat - not me tipping the sea up! detail enlarged - on the drawing this is less than half an inch highthe figures are just very loosely suggested, with their dog playing in the water. A new seascape finished, it's oil on a 24 inch canvas. Started with free calligraphic marks and finished off with glazes to get the subtle changes in the colour of the sand. Really quiet, calm and simplified, trying to get that lovely feeling of walking down to the waters edge on a blue blue sunny day. I thought after all the rain and cool weather paintings it was time to do a warm and sunny day :>) . 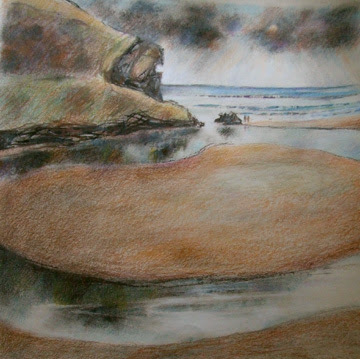 A busy day and no time to concentrate on the canvasses so I did a bit of drawing with coloured pencils on grey card - one of those sunny days with thin translucent white clouds veiling the sky. You may be getting bored with this view :>) - sorry - but it's interesting to me to try to capture it in all the weathers and lights I saw. I do love the light and the way it changes colours. Also to experiment with different media as the effects are so different. I've had recent discussions with friends about teaching styles - how we teach or are taught - the styles that we responded best to as students ourselves, tutors who really motivated us and the teaching methods that taught us most. I'm going to do a series of posts about teaching and learning styles and the way I teach. I thought today I'd share some of the artists quotes that particularly appeal to me - do you have any that really mean something to you? 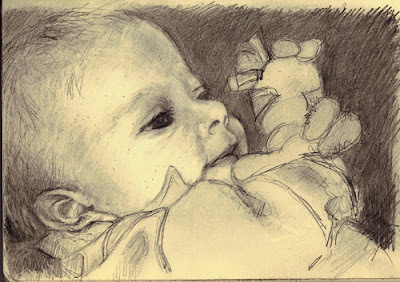 Cezanne: A work of art which did not begin in emotion is not art. Lucian Freud: When I look at a body it gives me choice of what to put in a painting, what will suit me and what won't. There is a distinction between fact and truth. Truth has an element of revelation about it. If something is true, it does more than strike one as merely being so. 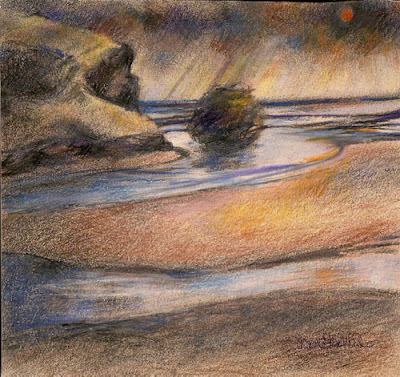 beach, charcoal and coloured pencil, 7 x 7.5 inches Vivien Blackburn Experiments. The scan isn't level - the horizon is :>) - a small version of the charcoal/cp beach trying out a cream cartridge paper as the background. The toothier paper worked much better, this is a little too smooth. I also like working larger better. And the landscape below was a mixed media demo of acrylics loosely applied to grey card (which shows through in places) with a palette knife and then worked on with pastels and a little coloured pencil. Winter Fields. mixed media. Vivien Blackburn 8.5 x 5.5 inchesI'm hoping to push on with the canvasses tomorrow. I said that I was mulling over whether to simply use white pastel for highlights and keep it monochrome or add colour - and if colour what medium??? 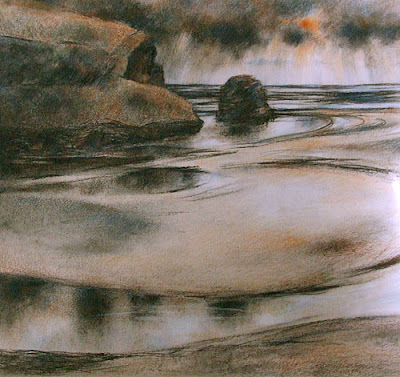 I decided to try coloured pencils over the charcoal and see how they worked - they worked! I wanted to keep the colours very muted, this kind of evening light softens and dulls colours and the cliff was deeply shadowed and backlit. I'm happy with how this one is going as it evokes to me what I wanted. 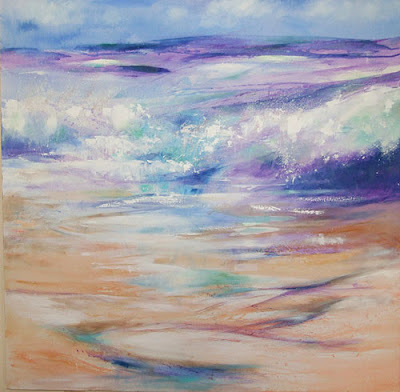 I'm not sure whether I'll glaze a bit more blue and viridian over the purple sections of sea or not - what do you think? It's hanging over the sofa just now so that I can consider it. I love working this size. I wasn't trying to catch a frozen moment of time with the waves in realist detail - that isn't how you experience it. 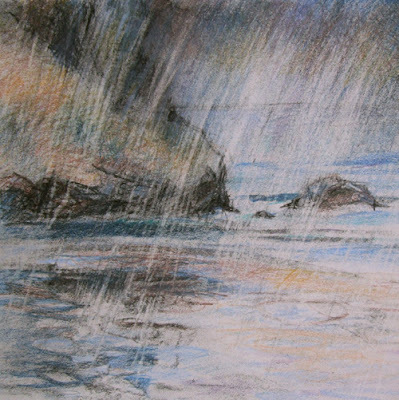 The waves come pounding in, funnelled by the shape of the beach, meeting each other in a crash of spray. It's all confusion. A horizon that isn't level, consisting of swells of water racing towards you, rearing up - power, colour and light and noise. I wanted to catch this feeling.